Today is White Cane Day, which, in all honesty, isn’t something I would have known if I hadn’t stumbled across a reference to it in the paper about a year ago. Either way, I thought I’d take the opportunity to write two longish posts. The first one, appropriately posted today, on October 15, will look at the history of the white cane and its use (yes, I did my homework, and this post might actually offer an opportunity for learning something, for which I offer my profuse apologies), as well as how it’s been depicted in the Daredevil comic. Later in the week, I will look at the billy club and its gadgets. That post will probably be quite a bit shorter since, early tampering aside, it hasn’t really changed all that much over the last forty years and doesn’t need its own history lesson. The cane, on the other hand, has been here there and everywhere. And, on average, about three decades behind its real life counterpart at any given time, the notable exception being most of volume 2, probably thanks to the ease with which anyone can now do basic research on the Internet. That’s not to say that writers and artists shouldn’t do more research, but I digress. Before getting started, I should probably mention that I’m pretty sure that it’s now generally established over at Marvel editorial that the cane and the billy club are no longer the same object, despite the assertion in sources such as the Marvel Universe Handbook that still claim that the billy club is “disguised as a blind man’s cane in civilian garb.” No one has ever come out and said this is no longer the case, but not only have we not seen one turn into the other in the pages of Daredevil for the last decade, we also have artists (most notably Michael Lark) who are now drawing a modern white cane, and it is clear that they are nothing alike. A white cane is supposed to be long, slender and light-weight (and made out of either aluminum, fiberglass or carbon fiber), whereas a billy club is used to inflict blunt force trauma. You get my drift. The modern white cane has two basic purposes. The first, and most obvious, is as a mobility tool. In other words, it works as a low-resolution scanning device to locate obstacles and landmarks. It also serves to identify the user as being visually impaired. It was this second reason that prompted the supposed inventor of the white cane, a blinded man from Bristol, to paint his cane white in 1921. He simply felt that he wasn’t visible enough and didn’t feel safe crossing the street near his home. This innovation caught on, and the practice spread throughout large parts of the world in the 30’s and 40’s. However, the white color aside, these canes were usually indistinguishable from a regular support cane and provided few benefits to their users. The situation was further complicated by the fact that many agencies for the blind were against the use of the white cane, primarily due to the stigma attached. The modern white cane, or the long cane, is a product of World War II. War is never pretty, but WWII did usher in a new era in rehabilitation medicine when large numbers of injured soldiers returned home. It is easily forgotten today, when stories of paraplegics entering Iron Man competitions almost seem commonplace, that in the first half of the twentieth century, people with spinal cord injuries weren’t expected to even survive long enough to be rehabilitated. The outlook for blinded soldiers was certainly more promising in terms of survival, but it was nevertheless a field in dire need of reinvention. The job of setting up a program for blinded soldiers within the VA system at Valley Forge General Hospital fell to Richard Hoover and Warren Bledsoe who were recruited from their staff positions at the Maryland School for the Blind. The two went about their new task with an incredible amount of passion and dedication. They rediscovered some of the forgotten work done by a W. Hanks Levy in the 1870’s, brainstormed over beers at the local bar and tested their theories themselves by donning blindfolds and trying out their techniques the hard way. They decided that a functional cane needed to be both thinner and significantly longer than the one currently in use, enough to offer the user a one-step margin (these days, two steps is the norm). They also essentially invented the modern method of actually using it. The two-point touch technique still carries Hoover’s name, and was really something of a revolution. One of the more interesting things about the technique is that it’s really quite counter-intuitive. Human bio-mechanics will instinctively lead people to swing the cane in parallel with the step (i.e. swing to the right while stepping forward with the right foot and vice versa). However, it turns out that you get more “bang” for your cane by doing the opposite, even though it goes against the conditioned reflex. At their disposal, Hoover and Bledsoe had large numbers of blind veterans to field test their techniques. The group they were working with was unique compared to a cross-section of the blind population in that the vast majority of them were totally blind while being otherwise young and healthy. They were quite eager to lead lives that consisted of more than being taken to the park on Sundays and had no preconceived notions about what was and wasn’t appropriate. Importantly, they had no specific prejudices against cane use. One of the first patients to come under the tutelage of Hoover and Bledsoe was a Russel Williams who had lost his sight in combat in Northern France in 1944. After spending time at Valley Forge and learning the new and innovative skills of cane travel, he was transferred to a different center at Avon, where echolocation was the method of choice. Williams managed to integrate the best of both techniques while adding knowledge gained through his own trial and error. His success was remarkable and he not only became an early role model for other veterans but eventually ended up running a new program at a different facility. Gradually, these early efforts lay the groundwork for the modern field of orientation and mobility for the blind. The modern techniques were in place and the canes used – while still not featuring the straight handle that is the norm today – were relatively long, thin and made of lightweight metal. As far as the Daredevil comic goes, it would take artists decades to catch up to the 1950’s. Not too bad for a book first published in 1964, huh? Here is another Stan Lee gem, this time with art by Gene Colan, taken from Daredevil #49. 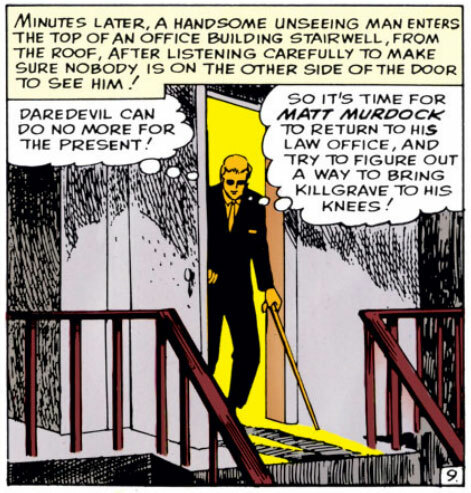 Note the fact that the cane isn’t even touching the floor and early Matt Murdock’s characteristic self-pity and obvious self-esteem issues. That has nothing to do with the cane, per se, I just happen to find it somewhat amusing. It’s hard to find any actual panels around this time with Matt appearing in his average blind lawyer guise, but here’s one from Daredevil #107. The writer for this issue was Steve Gerber and the artist was Bob Brown. And, yes, the cane actually is white in this issue, taking a 1970’s Matt Murdock from the 1920’s to the 1930’s. That’s progress for you. Above is a classic scene from Daredevil #168, with story and art by Frank Miller. Miller may have ushered in a new era in storytelling, but the cane is back in the 1920’s again. The above, as you can clearly see, is by Denny O’Neill and William Johnson. The issue in question is #201 and features something as rare as a straight white cane. It’s very short, and if we didn’t know that Matt had heightened senses to keep him out of harm’s way, the fact that it’s completely useless might explain the bandaged parts of his body. Here’s an odd one from one of Ann Nocenti’s odder issues, included here because it shows at least an ounce of innovation in depicting Matt with a folding cane that is most certainly not a billy club in disguise. The issue in question is #277, and the artist is Rick Leonardi. White, short and very 1950’s (minus the length) in Daredevil #312 by D. G. Chichester and Scott McDaniel. This is from Matt’s big return from fake death in issue #353, by Karl Kesel and Cary Nord. I included both panels here just because I like the Lois Lane cameo. Do note, however, that Matt appears to have to bend over in order to reach the ground. Moving on to volume 2, issue #11, we move back in time once more, as the cane stays short and changes colors again. Story by David Mack and art by Joe Quesada. This is from issue #64 (vol 2), by Bendis and Maleev and included here for its coolness factor. Matt keeping a stash of extra gear is pretty cool. The cane is a little too thick however. I’ll see you in a couple of days when we take a look at the billy club! A fascinating history! I didn’t know about the WWII research – just as with limb protheses now, the side effects of a war often means progress for disabled people, just as it does for technology in general. I’ve seen canes as short as the one Matt is holding in the picture with Echo, but held very loosely in the hand (or by the loop), and ones as long as five feet. And none of Matt’s seem to have a tip on them! Wow – that’s an incredible bit of research… I had no idea. I’m wondering if the cane in issue 277 was meant to be coloured in brown (for Matt’s billy club) but the colourist forgot? 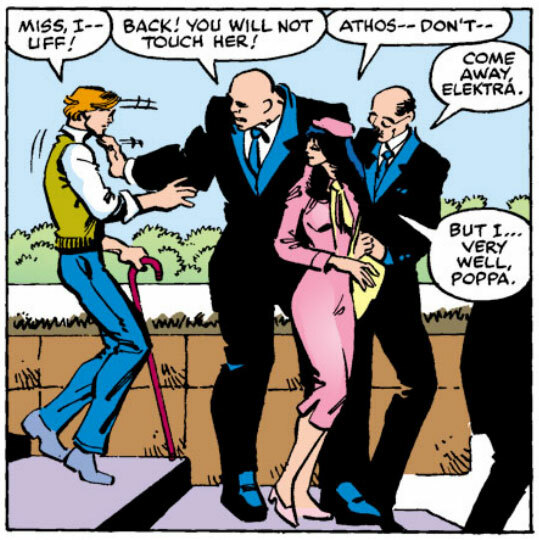 I almost couldn’t believe Lois Lane had a cameo in DD, given copyright issues. That’s awesome. Really well researched article. I’m glad that lately they’re finally showing the cane in a more realistic manner. If only these artists had done as much research as you. Yeah, I wonder how they worked out the thing with Lois Lane. I’m not surprised if they simply got permission, though. Lois is getting some free advertising here. Besides, I think this was from around the time when there were quite a few bona fide cross-over events anyway. Either way, it’s pretty cool. Just taking advantage of this flashback post to comment on the Lois Lane cameo. It’s certainly not the only one. Back in the beginning of Walt Simonson’s run in Thor, when Thor lost his ability to turn into Donald Blake, there’s a lovely scene where his new disguise is a pair of glasses (which Nick Fury comments “works for the other guy.”). Then, as he’s leaving his office, he runs into Clark Kent and Lois Lane, who think he looks familiar but can’t quite place it.